The inspiration for the church's creation was a miraculous event in 1754 when Amerindian Maria Mueces and her deaf-mute daughter Rosa were caught in a very strong storm. The two sought refuge between the gigantic Lajas, when to Mueces's surprise, her daughter Rosa exclaimed "the mestiza is calling me" and pointed to the lightning-illuminated silhouette over the laja. This apparition of the Virgin Mary instigated popular pilgrimage to the site and occasional reports of cases of miraculous healing. The image on the stone is still visible today. The current church was built between January 1, 1916 and August 20, 1949, with donations from local churchgoers. 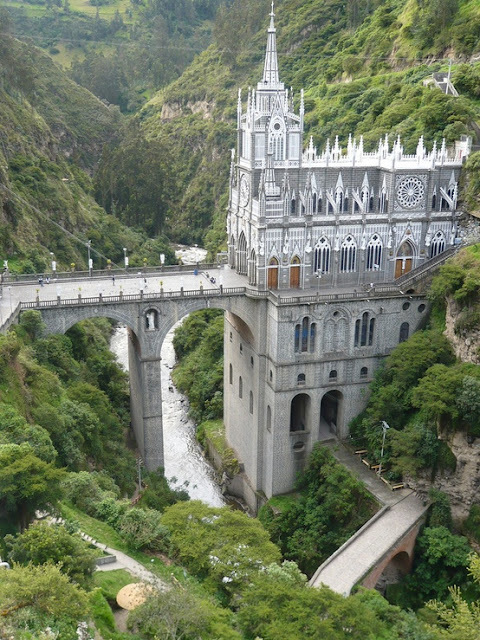 It rises 100 m high from the bottom of the canyon and is connected with a 50 m tall bridge to the opposite side of the canyon.